The siege of Spanish-occupied Dunkirk, 1658, by Turenne's Franco-English forces, covered by ships of the Royal Navy. 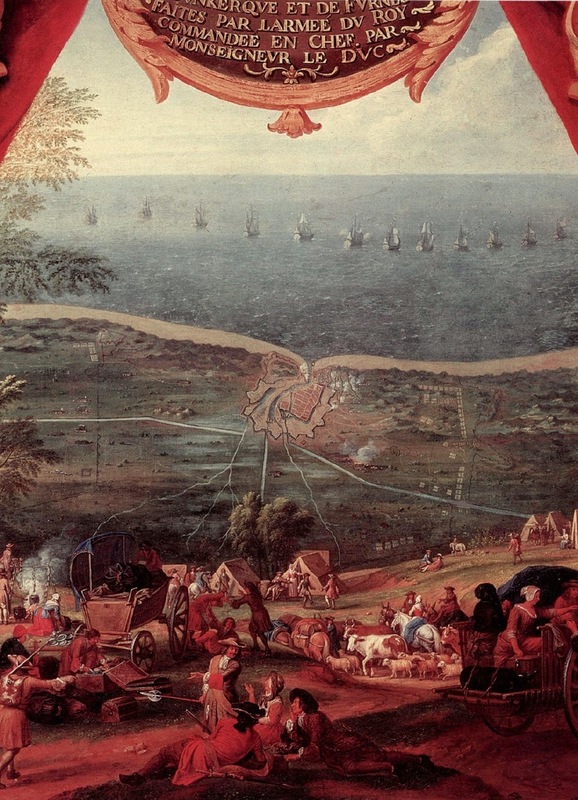 The Netherlands of the seventeenth century was a disjointed group of provinces. The northern area was known as the United Provinces and was controlled by the Dutch, whereas the southern provinces (modern Belgium) were under the control of the Spanish Habsburg monarchy, which had ruled all of the Netherlands prior to the successful Dutch rebellion in the sixteenth century. The southern provinces first attracted French interest when King Louis XIV decided to establish a more secure northern border at the expense of the Spanish, who had long been French rivals. Louis believed that the Scheldt River should serve as a natural northern boundary for France, and in 1667 he set about to make it so. Louis had an extremely tenuous legal claim to that territory through his marriage to Spanish Princess Maria Theresa, who was the daughter of Philip IV by his first marriage. Though Charles II 100 came to the throne, he was the son of Philip’s second marriage. Louis claimed that Maria Theresa’s inheritance should outrank that of the progeny of Philip’s second marriage and, therefore, the Netherlands were Maria Theresa’s by right. It was an incredibly weak claim, but almost no one was in a position to challenge it. Louis had created one of the largest European armies ever, numbering some 120,000 men, and he entered the Spanish Netherlands on 24 May 1667. He enjoyed early success against the unprepared Spanish. By October, Louis’ general Turenne captured a vast number of towns and forts and controlled the entire area. Having accomplished such easy victories in the north, Louis turned eastward in 1668 to occupy the Habsburg province of Franche-Comte on the Swiss frontier. No one was prepared for Louis to launch a winter offensive, but he ordered Conde, the governor of Burgundy, to do just that. Conde’s force of 15,000 invaded the province on 3 February 1668 and conquered it in two weeks. Louis rode to Franche-Comte to accept the surrenders of the local leaders; within three weeks the province was in French hands before any other country could react. Louis had spent the last months of 1667 negotiating with possible rivals, and had threatened or bribed many into submission, or at least cooperation. Most German princes accepted his bribes and stayed clear of his military power. In January he concluded a secret treaty with Leopold, Holy Roman Emperor, in which Louis would cede to him the Spanish throne upon the imminent death of Charles II; he would also give up French claims in the West Indies, Milan, and Tuscany. In return, Louis would receive the Spanish Netherlands, Franche-Comte, Naples, Sicily, and Spanish possessions in Africa and the Philippines. Though the treaty would reward him handsomely and confirm his possession of France’s northern frontier, it depended on Charles II’s death, and that could not be predicted. Therefore, Louis continued plans for invading deeper into the Netherlands. Afraid of his aggression, three nations allied themselves to oppose Louis. Holland convinced Sweden and England to join forces, and the alliance proposed a negotiation period through May 1668, beyond which the three nations would make war against France on land and sea. Louis’ advisers were divided on the wisdom of continuing the fighting. Spain had been unable to provide troops for the defense of the Netherlands because of problems at home, but the Spanish had made peace with Portugal and might now turn their attention to Louis. The possibility of being surrounded convinced Louis that the secret treaty with Leopold was worth waiting for, so he entered into negotiations with his opponents and signed the Treaty of Aix-la- Chapelle on 29 May 1668. Under this treaty Louis kept only two small pieces of land along the northern French province of Artois. The invasion Louis launched in the summer of 1667, sometimes called the War of Devolution, was nothing more than a precursor of fighting to come. It proved his ability to handle international diplomacy, and it was the first serious military campaign in which he himself participated; this gave him increased confidence in the ability of his nation and his subordinates, and provided France with a small province that acted as a buffer for possible Austrian or Swiss invasion into northern France. The peace signed in May 1668 proved to be nothing more than a ceasefire, and Louis invaded the Netherlands again in 1672. Louis realized that to gain control of the Spanish Netherlands as soon as he hoped, he would have to break the Dutch, who feared France as an immediate neighbor. Between the two wars, Louis broke the Triple Alliance of Holland, England, and Sweden. Sweden had long had profitable trade relations with France, and was easily convinced to change sides. Remarkably, England proved almost as easy. Though the two nations had long been at odds, England’s King Charles II was a Catholic ruling a predominantly Protestant country, and he had continual troubles with Parliament. Louis offered moral support not only as a fellow Catholic but as a fellow monarch, one who exercised more power in his country than did Charles in England. The thought of gaining personal power at the expense of Parliament (as well as strengthening English naval dominance at Dutch expense) appealed to Charles, and he fell in with Louis’ plans in 1670. The Holy Roman Empire maintained the neutrality it had pledged in the secret 1668 treaty, and most German princes were quiet or cooperative with French bribes. Holland was isolated, and Louis could depend on the British navy to counter the Dutch fleet. 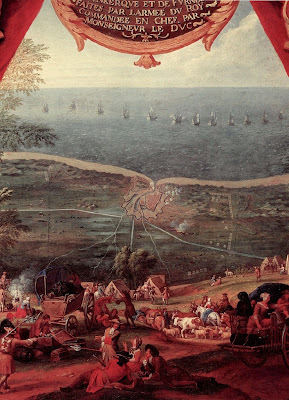 Britain struck first, declaring war on Holland in March 1672. Louis was quick to follow up with an army much strengthened since the end of the last war. Aided by the talented general Turenne, who had trained Louis’ army, and the brilliant fortification engineer Vauban, Louis had what seemed to be an unbeatable force. French armies rolled into Holland, and towns fell with remarkable ease. The country seemed helpless before the onslaught, and was saved only by Louis himself, who ignored Turenne’s advice for a quick drive on to Amsterdam in favor of laying siege to a number of forts that he could easily have bypassed. The hesitation in attacking Amsterdam saved the Dutch. They sacrificed years of work for their own defense: They broke the dikes and flooded the approaches to the capital city. No one expected such a radical maneuver, and it brought French operations to a halt. A change of government in Holland brought William of Orange to power, and he proposed to cede Maastrict and the Rhine towns and pay a large indemnity. Louis refused that, and a later, more generous offer. Louis’ pride cost him dearly, because he gave up the chance to gain virtually all he wanted for little cost. Instead, he demanded that the Dutch demilitarize their southern border and pay a higher indemnity, which they refused. War was declared, but the flooding ended campaigning in the Netherlands for a while. The following summer, a new coalition formed to oppose Louis; it was made up of the Dutch, the Holy Roman Empire, and the Spanish. They successfully captured cities in German states Louis had previously bribed. Louis’ money proved too little an inducement to resist the new coalition; most German states began to join it because they were Protestant and feared Louis’ increasingly Catholic viewpoint. Britain also pulled out of the conflict when Parliament forced Charles II to make peace with Holland. Louis was now isolated but undaunted. He ordered Turenne to invade the Franche-Comte, which he had so easily conquered in 1668. The campaign took six months and provoked a response from the coalition. In August 1674, they drove Turenne back along the Rhine frontier and threatened to invade, held back only by the arrival of winter. Turenne surprised them with another winter offensive just after Christmas and secured the French frontier by a successful campaign in Alsace. After that, the war settled into one of defense. Turenne died in July 1675, and Louis lost his most able general. Conde replaced Turenne, but failing health forced his retirement by the end of the year. Louis spent his time between the battlefield and Versailles, and in the spring of 1676 was back with his troops. He was in a position to score a significant victory over William’s forces near Valenciennes, but hesitated when he received conflicting opinions from his advisers. He returned to his favorite pastime of siegecraft, and the Dutch army remained intact. The French navy was successful in the Mediterranean in 1676, but the lack of progress on land, coupled with a rising discontent among segments of the French population, gave Louis pause. The destruction in the frontier provinces was costly, and he had had to increase taxes and revert to the sale of offices to pay for this war. There was little active campaigning in 1677 other than some successful sieges, but William of Orange married Mary, daughter of England’s James II, a union which could presage a closer Anglo-Dutch bond, and this worried Louis. In 1678 he agreed to peace terms at Nijmegen in Holland, then concluded separate treaties with Spain and the Holy Roman Empire. Though required to surrender many Dutch towns, he acquired many more in the Spanish Netherlands and had a belt of fortresses covering his northern frontier reaching from Dunkirk to the Meuse River. The two conflicts against the Netherlands had taken France to the height of its prestige, power not to be seen again until the time of Napoleon. The financial cost had provoked some domestic discontent, but Louis’ success solidified his strength as absolute monarch. It also whetted his appetite for more glory and more secure borders, both of which he pursued in later campaigns: the War of the League of Augsburg and the War of the Spanish Succession. References: Hassall, Arthur, Louis XIV and the Zenith of French Monarchy (Freeport, NY: Books for Libraries, 1972 ); Israel, Jonathan, The Dutch Republic: Its Rise, Greatness and Fall, 1477–1806 (Oxford: Oxford University Press, 1995); Sonino, Paul, Louis XIV and the Origins of the Dutch War (New York: Cambridge University Press, 1988).